The next series of blogs will be an in-depth review of the recognition and management of musculoskeletal trauma in the wilderness, marine, disaster, and military environments. This body of knowledge is the best example of the difference between urban, or street medicine, and the extended care environment. In the urban realm, typically, the ER is just minutes away and the primary concern is to stabilize the fracture or dislocation in the position found, and transport. Once outside the golden hour, the primary concern becomes circulation distal to the site of the injury. This may require straightening out angulated fractures, reducing dislocations, proper long-term splinting with big, ugly, fat, fluffy splints, and monitoring the circulation every 15 minutes for the duration of the evacuation. Consist of a dense cortex surrounding an inner, soft marrow and they provide the rigid framework to which everything attaches. Bones also store calcium, an essential electrolyte, and produce the blood cells in the bone marrow. flex and rotate smoothly and without friction. Cartilage also provides support for muscle in areas where more flexibility than bone offers is needed. Is the tough fibrous layer that covers the bones and which contains the nerves that produce the pain associated with injuries. Is the lubricant in the joint space produced by the synovial lining of the joint capsule that surrounds the joint, allowing for friction-free movement. Are the ties connecting muscles to bone. They span joints and allow for movement. Are like nylon cords and attach bones to other bones. They span joints, maintaining proper alignment and setting the limits of range of motion. The contraction of muscles provides us with purposeful movement. The contraction of muscles produces heat. The strength and flexibility of muscle protects many internal structures including the bundles of nerves, arteries, and veins beneath the muscles. The bones act as a large calcium store. Calcium is an electrolyte that allows for the contraction of muscle, including the heart muscle, and the conduction of nerves impulses. The process by which the various blood cells (red blood cell, white blood cell, and platelets), are produced in the bone marrow. The muscular and skeletal structures contribute greatly to how we look. A dislocated patella typically occurs when a force is applied to the medial side of the patella forcing it laterally out of the femoral groove in which it rides. The patella is held in place inferiorly by the patella tendon and supported on the sides by the medial and lateral patella femoral ligaments. The patella almost always dislocates laterally. When this occurs, the patient will be in significant pain with their knee flexed and the patella displaced laterally. As with most dislocations, the longer the patella remains out of joint, the more swelling there will be in and around the joint. This swelling makes it harder to reduce. So, the sooner the joint can be reduced back into normal anatomical position, the better. With one hand grasp the ankle. Place the other hand on the lateral aspect of the knee with the fingers in the popliteal space and the thumb against the lateral aspect of the patella. 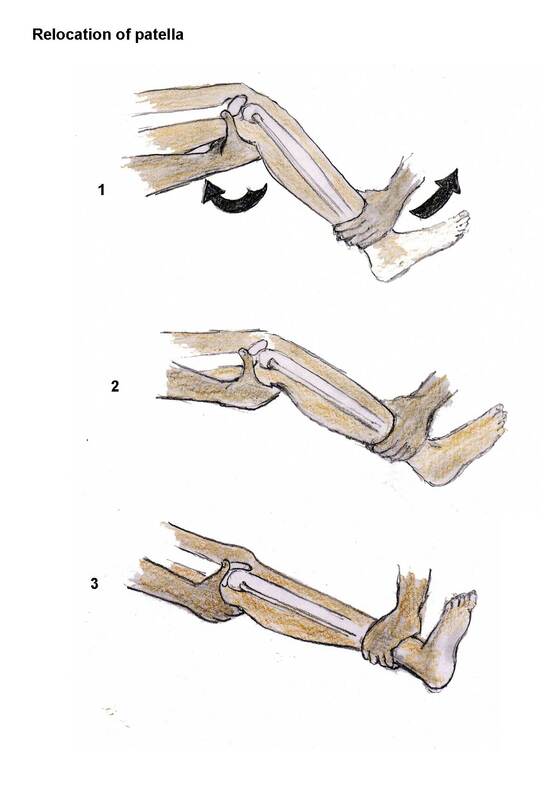 As you push against the patella with your thumb, slowly straighten out the leg with the hand that is on the ankle. As the leg extends, the patella will reduce back into normal anatomical position. Once reduced, wrap the knee with a 6” ace wrap for gentle compression and to minimize swelling, then splint the leg straight. Because of the risk that the medial patella ligament has been partially torn and there may be other ligamentous damage, the knee has to be splinted straight. Once the knee is wrapped and splinted, the patient may try to walk with the leg stiff and straight. If the injury was only a dislocated patella and ligamentous sprain, walking should be pain free. Please note: in the event that the patella does not reduce, splint the leg in the position found and transport in a litter. 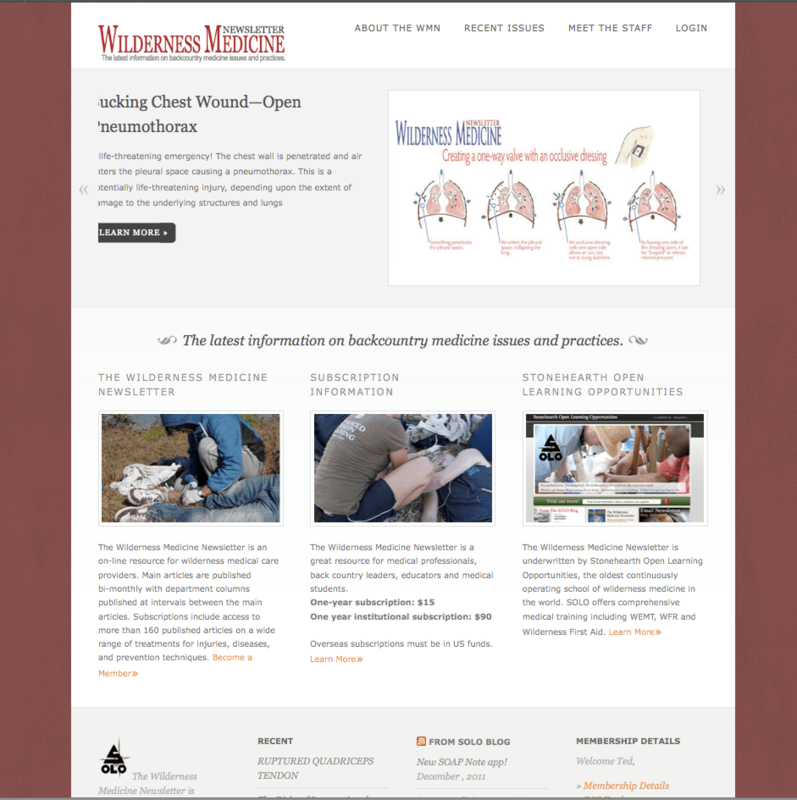 For more information see the Sept/Oct 2004 issue of the Wilderness Medicine Newsletter.